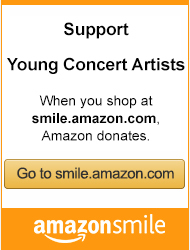 Invest in YCA’s future and in the future of the music you love. When I created the Sheldon Soffer Fund for New Music, I did so with the aim of commissioning our YCA composers to leave a work for posterity to be performed not only by our present YCA artists but future artists. Such a legacy would be a historic one as it will be a unique gift to audiences and artists FOREVER. As part of the impact I’d like to have on YCA, I am making a bequest to increase the current endowment of the Sheldon Soffer Fund for New Music. The YCA Composer program has been so successful, and the music they write for our YCA artists will live in perpetuity. For YCA, legacy gifts both large and small will allow our beloved art form to flourish. I hope you will consider this note and begin thinking about what legacy gift you might plan for Young Concert Artists, which will help future generations of young musicians and composers, and inspire listeners the world over. Planned gifts play an extraordinary role in ensuring the vibrancy of Young Concert Artists and the as-yet-unknown artists who will infuse the music world with excitement and new energy. Planned gifts can also provide tax advantages. We are deeply grateful to Sheldon Soffer, who has secured his dream for YCA with his bequest. Your bequest can be personally designated for a particular program, an instrument, or to honor a family member. Bequests become part of the Young Concert Artists Endowment Fund, which has been the most important source of support for all of our activities and special programs. We hope you will consider investing in the future of YCA and our incredible artists. If you have already made plans for YCA in your will, we would be so pleased to recognize you now, so please let your bequest intentions be known! Call or email Mary Chen at (212) 307-6655. Cash bequests are exempt from federal estate tax. Please consult your attorney and financial advisors about decisions that affect your estate plan.